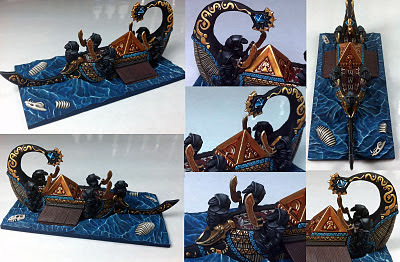 I am a big fan of this "movement" in the hobby. I always felt that there should be more coherency between the background of WH 40k and actual models. There are different approaches to the process of enlarging space marines. 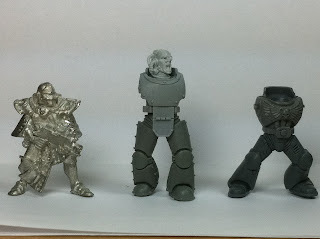 Some people prefer to use terminator models as a base for tactical marines armor. 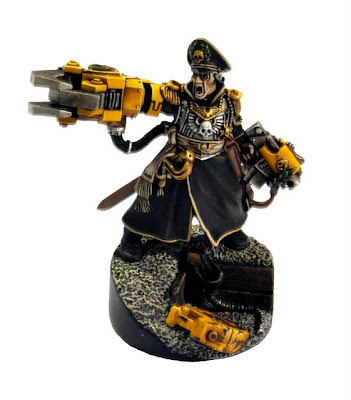 Some people enlarge the actual gamin bases so marines look taller. Others use a plastic card to increase the dimensions of the stock model. Personally, I combine the later method with sculpting. I feel that to increase the height of the model is not enough. You also need to increase the width of it. My Mk III power armor that I used for my Blood Drinker sergeant is mostly sculpted. While I was working on it I tried to keep the "true scale" concept in mind. 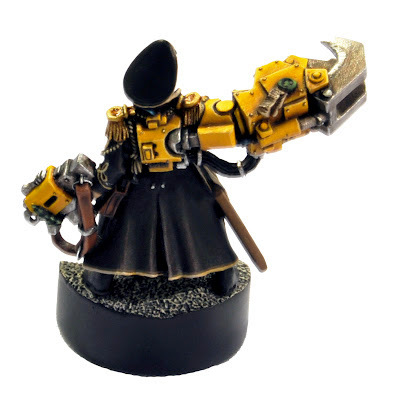 Below you can see this model next to the sisters of battle and regular marine. Today I will continue with another charity project that I finished last year. A good friend of mine, Dave Taylor, offered me a chance to participate in Heroes of Armageddon project and provided me with a chance to work on the center piece of his Steel Legion army - Commissar Yarrick. At first I was thinking to go with traditional colors (black, red, gold) but after talking to some of my friends I decided to use yellow as an accent color. 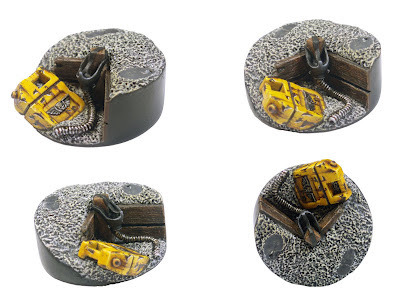 This will make Yarrick more coherent with the rest of the Steel Legion models. My first choice was to show Yarrick on top of WW II type trench. But Dave pointed out that Steel Legion is a mobile force that doesn't have much use from trenches. I was not able to take a picture of finished Yarrick model due to the fact that I was finishing it the night before my flight to Chicago's GD. Here are some good pictures of my model taken by Dave Taylor.